We as a species have achieved quite a bit over the past century. Among these achievements, space travel may be one of the most notable on the list. As far as we've come, we might consider the possibilities for what we might accomplish during the next century. Who knows how far we might progress? According to Corey Goode, as well as many of David Wilcock's insiders from various high-level military and paramilitary programs, countless advancements have been made in outer space which stretch far beyond the perspective of those here on the surface. There could be dozens of races out there tens of thousands of years more advanced than our own. In fact, according to past intel received from reliable insiders, the SSP is currently in regular trade with over 900 different species. It seems that we are anything but “alone”, even though our collective governance continually deny the fact. Until we raise our collective voice loud enough and demand Full Disclosure, we will continue to receive the half-truths of partial disclosure from the mainstream media. Fortunately for us, series such as Cosmic Disclosure have continually telegraphed entire narratives of the partial-disclosure script, and have confirmed much of what many of us have suspected of being true regarding off-world activities. This particular episode of Cosmic Disclosure focuses on the origins of the moon and how the coming of this astral mystery to our solar system may have helped give rise to advanced life on Earth. 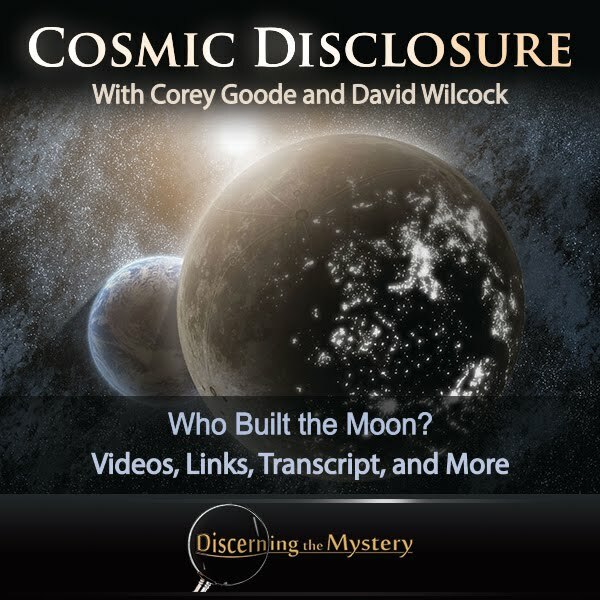 With that, here is the show transcript for Cosmic Disclosure - Who Built The Moon? David Wilcock: Welcome to “Cosmic Disclosure”. I'm your host, David Wilcock and I'm here with Corey Goode. And in this episode, we're going to continue our discussion about the Super Earth and specifically the survivors of this terrible cataclysm that, according to multiple insiders who I've been in contact with and the information that Corey has gotten directly, was destroyed, and the fragments are now what we call the Asteroid Belt, which is parked between the planets Mars and Jupiter. So this is going to be some very interesting information, stuff that many of us have wanted to know for so long, answering so many mysteries. David: Now, I want to get into what Richard C. Hoagland's top insider, Bruce, was telling me about the nature of the civilization on the Super Earth. There are far too many correlations between what you saw on the smart glass pads and what he told me for it to be an accident that these things line up so well, in my opinion, and it was utterly mind-blowing for me when we first started talking in October of 2014 in detail how much of the stuff that he had said that you independently could verify from your own firsthand reports. And, again, it's difficult to explain to people how much this happens when you start talking to different insiders. I was holding onto so much information that I had never put online so that people would trust me, so that I would continue to hear more. Also, if it's going to get me killed, if it's going to get me in trouble, then I'm not going to put it out, whereas now that we've done this, it's time to just open the floodgates and let this stuff come out. I want to go back now to what Bruce revealed about the actual race that was on the Super Earth in the first place. First of all, he said that their height was 70 feet. Maybe this is because the planet is larger, so, therefore, the gravity is different, and the beings will be larger in correspondence with a larger planet. Would you say that's possible? Corey: Yeah, different barometric pressure, all kinds of stuff. Yeah. David: He said that this race was extremely technologically advanced. That was the data that they had concluded, and apparently they were playing around with transhumanism, which is the idea of integrating their human form – because it was a human form, it was just a giant human, 70 foot tall, 70 to 90 foot tall – integrating their human form into some kind of computer, Internet type of mainframe. Corey: If they were tinkering around with something like that, I could see how that would lead to major problems. David: Another piece of data that he seemed to be very convinced was solid, which I then got validated independently by the space program insider, Jacob, was that these people had long since evolved passed the need to use verbal communication, that the idea of speaking with their mouths was terribly slow. And he was specifically told that they developed some type of Internet, Wi-Fi-type of method of communication . . .
David: . . . that involved microfluctuations in the light that was on their faces, the skin pigment or something. Corey: Micro . . . Like, we have micro-facial expressions. They would have micro-facial auric light. It was kind of like a light show. David: So you did hear that? Corey: Yeah, and they're not the only beings that do that. Some that communicate telepathically, there is a light, kind of an auric kind of play of light as well. David: So you can confirm that some people are actually having cyborg-type of integration with their brain and the voltage on their skin so it's like a broadband Internet of data passing between two people when they look at each other? Corey: I'm talking about . . . There are some advanced beings that, when they communicate, they have auric discharges in their body when they're connecting telepathically. There is more information. There is a huge exchange of information going on. David: Is it possible that what Bruce said is true, that it could be entirely cybernetic, that it could be based on computer technology that wires into the brain, but then it triggers these fluctuations on the face? Corey: Sure. If they were unwise enough to start wiring things into their neurological system, then, of course. David: Well, that's exactly what he said they were doing, and he said that they had developed the ability to upload their actual consciousness. Corey: Did they find bodies? Did they find bodies with this type of implants? David: Apparently, that is part of it, and I'll get to that in a minute. David: But it's interesting, right, because he's hearing things for the first time, too. Nobody gets the full picture, right? David: That's part of the thing that's so frustrating about this is even at the level you were at, it's compartmentalized, and you don't get to hear all the data that's available. Corey: Right, yeah. There are certain areas of the Lunar Operation Command I haven't been allowed past. David: Okay, so we'll get to the bodies that they found in a little bit. David: Continuing the Bruce narrative, he said that they had a technology to be able to build bases inside these moons, and the technology involved something that was only the size of a baseball. And I guess the smaller size made it easier, and they could send this into the past, and then it would go into the past, and it would build out with little nanite robots. They would dig their way through the moon and build the base. And they would send it to the right time so that the base would be ready when they wanted it in their time. Have you heard of anything like that going on, anything like that being done? Corey: Not sending, like, some sort of cube back . . . or some sort of sphere back in time that has nanites. That sounds like, you know, a lot of this AI kind of stuff. David: Right, but it could be possible that a technology like that would have existed. Corey: With all the things I have seen, I can't say that it's not. David: Okay, so there actually is a little video that I want to show you right now of a robot that is just a piece of foil that they've already made that has a little processor chip on it, and it can carry things around. Let's take a look at this right now. This video creeps me out because if you have these little guys that can just kind of flutter around and carry things and move things and build things, and if they then can develop a replicating ability where they can eat material – and this is what we already have right now. Imagine if our technology is 100 years more advanced, 1,000 years, 10,000 years more advanced. These type of nanites could go crazy, couldn't they? Corey: Yeah, like I said. When it comes to nanites and artificial intelligence, there is a major red flag and issue that everyone in the Secret Space Program and also members of the Super Federation . . . there's a major problem, a major red flag with that technology. David: Let's get into the moon now because that's the focus of this episode. What did you hear about the moon before they moved it to the Earth? Corey: There were reports of them building bases so far deep that it came to this artificial material that made up the surface, or the fuselage, of what the moon was. David: So are you saying that there is a fuselage in the center of the moon, and that they dug all the way down to it? Corey: Personally, I don't know. There were two different reports, one of them saying that it was a hollowed-out moon that was used hastily, and another one that stated that it was a giant station that was built. David: Did you ever personally hear anything suggesting that the Earth's moon is older than any of the other objects in the solar system? Corey: I heard something along the lines either that it most likely didn't come from our solar system, or that it was too old for the items on the inner solar system, or something along those lines. I don't recall exactly the details, but there was something that didn't match about the geological age. David: Okay. For what it's worth, the insider, Jacob, who we're not ever going to get on camera, what he told me was that the moon was portalled in to our solar system, that it's older than the planets in the solar system, from somewhere else, that these people on the Super Earth portalled it in at the last minute after having sent – and this now gets back to what Bruce said – that they sent this baseball-sized chunk of nanites to this old solar system somewhere way out where their enemies weren't looking, because they knew now that the enemies were coming in to destroy them. They knew that their ring was going to be destroyed, and their planet was going to be destroyed. They had very little time. So the story that I heard, for what it's worth, is that this little baseball of nanites was sent to this other ancient solar system, that the moon was over there, that it went way back in time so their enemies wouldn't find it. They built out the moon with the nanites, portalled it in, and then the elites of this planetary civilization on the Super Earth, at the very last minute, right before the planet blew up, they portalled themselves into what we call the moon. And this is where it gets really strange because what Bruce said is it was 12 to 16 billion of these people, 70 to 90 feet tall, that all portalled in to the moon. And he said that they had firsthand knowledge that it was 20 to 40 miles deep of all built out intelligent habitations, rooms, the entire circumference, the entire sphericity of the moon on the inside, 20 to 40 miles deep, all just endless amounts of corridors that you could go through. So it doesn't mean it's not true, . . .
David: . . . it just means that you personally didn't encounter it. David: But you did say that you heard that there were some kind of refugees from this catastrophic event, the destruction of the Super Earth, that were associated with the moon somehow. Corey: Right, that arrived on the moon and came down to the Earth as refugees from one of the great cataclysms. David: In Bruce's timeline, they spend a long time inside the moon before they actually go to the Earth, so let's just talk about this now. Did you hear that the people were inside the moon or on the surface of the moon when they fled the catastrophe? Corey: They said they came in the moon. David: That's consistent with what I heard, which was that the moon was getting battered by asteroids. Nobody would have been able to be safe or survive on the surface, so they had to be inside, and that they created a very highly advanced computer course to guide the moon into orbit around the Earth, specifically also because if they didn't find a planet to go around, they were going to get gravitationally captured by the sun, and they would be burned up in the sun. And they programmed the orbit around the Earth to create tides and make the Earth into a much more habitable place to live, eventually. It wouldn't happen right away. So did you also hear that the moon going around the Earth led to the tides and made it a better place to live? Corey: I know that it definitely brought a lot of changes, but there was life before. David: Yeah, and he said that, too. David: But the tides obviously could be causing a much more dynamic and diverse amount of life on Earth and make it so the oceans can get a lot larger, that kind of stuff. David: What he was told was that the Earth was like a swamp, and that it was really hot, and that there were only shallow seas prior to this happening. Is that also something that you heard? Corey: Well, I mean, I've heard basically the whole basic timeline geology, timeline of the Earth, that everyone else has heard. It's fairly consistent, except they leave out major and minor cataclysms that happened throughout the history of the Earth. David: So did you hear that at one time the Earth was swampy and hot and only had shallow seas and wasn't very nice to live on? Corey: It was much different. I didn't hear that it wasn't nice to live on. David: Okay. So the next thing is he said that these people, these 12 to 16 billion people that portalled into the moon, which were like the elites of their society . . . I guess first of all, that little part of the story, that's consistent with the very common breakaway civilization narrative that you've encountered, right? David: If you have a population of well over a trillion people, 12 to 16 billion is a very small number of them, and those people are going to save their own necks when they know that everybody else is doomed. David: So what he said was that their intel was that the moon was pounded and that most of these people inside the moon all died in that initial event. So by the time the moon got to the Earth, it was very heavily damaged. Is that at all consistent with what you heard, that the moon took severe damage on the way in here? Corey: Yes, and it's consistent with the way the damage is lined up on the moon when you look at it. David: That I don't understand. Could you explain that? Corey: There is one side of the moon that has quite a bit more damage, and it's kind of like what happened to Mars a little bit. One side of the moon has had quite a bit more damage to it compared to the other side. It's more pristine. David: Well, now, right at the time that he was telling me this and saying it was an authorized disclosure, we start to see all these news reports where what they did is they take the moon, and they turn it on a slightly different angle and these seas, the mares as they're called, these dark areas, all form a square – a big giant square that covers almost the whole face of the moon. You just tilt it a little bit and you look at it, and it's a big giant square. Corey, this stuff is mind-blowing. A geometric square should not exist on a natural satellite like that. What do you think we're seeing there? Why would they be telling us this? Corey: It's a soft disclosure because at some point, if they're going to do a partial disclosure and let us know that there used to be ancient ETs in our solar system like we discussed before, then one of the things they're going to want to show us are there are a lot of surface ruins on the moon. And there are a lot of images we can show. There's a giant tower that's twisted and shattered, or twisted and bent over as though it was hit with a blast wave. David: When we go back to the movie “Alien” with Ridley Scott, there's this weird spaceman creature thing that's a giant in an extraterrestrial ancient ruin that they find, and then that story is followed up with “Prometheus”, the movie, where you have these giant, bald, very pale-skinned ETs with these black eyes. I had a horrible time watching the movie. Some people really like it. I thought it was very traumatic to watch. Below are a number of screen captures from the movie "Prometheus" by Ridley Scott. According to Corey Goode, these types of sci-fi films are a form of soft disclosure (part of the "partial disclosure" narrative), where a portion of the truth is given while the majority of the truth is twisted in such a way as to distort the true history of cosmic events. This movie was an example of a cabal belief system being converted into a film so as to encourage the rest of society to accept this cabal faith. Soft disclosures such as those we may find in science fiction movies can be deceptive, as they typically take obscure subject matters such as the ancient history of solar system, and add so much extra material that it is difficult to decipher the truth from the fiction. The journey is not the same, and the hero is no-longer positively admirable. This seems to be the case, as the majority of the new films which come out of Hollywood are no longer geared toward simple entertainment. Instead of new, creative, and progressive ideals fueling this industry, we have an endless stream of remakes of recently purchase movie titles (of the most profitable movies) rehashed and remade for seemingly no other reason than to superimposing negative, fatalistic, and self-destructive themes for the sake of furthering some cult-based ideology. This is not my idea of attractive entertainment. David: But do you think that this aggressive, angry entity – the giant - treating humanity as it is now, as an aberration, that we must be killed, that we were an accident, that this one guy from their civilization made us because he came to the Earth – and remember, he dissolves at the beginning – do you think that that is a statement of Cabal belief system about this Ancient Builder race and stuff? Corey: Very much so. Yes. David: Okay. Could you talk a little more about that for a second? What is the belief system? Corey: Well, I've heard several different versions of their belief system, but basically their belief system is that this Ancient Builder race is their – one person called it a progenitor or their ancient bloodline. They are an elite. Their bloodline can be traced back to these ancient ET gods. David: Why do the gods hate us then? Why are they trying to kill us? Corey: Well, that fits in with their narrative of removing a certain amount of the population off the Earth because we're useless eaters or genetically impure. That fits into their mythos and sick religious dreams of the future of mankind. That's as they would like to see it. David: So does a movie like “Prometheus”, where they go and find these very ancient ruins, is that like a religious sacrament for these people, that it's the closest they feel like they can get to seeing ruins, that maybe because they're in the Cabal on Earth they're not actually allowed to see? Are they told that these movies are showing them something that's very close to what it really looks like? Corey: It depends. A lot of these people are out there doing scientific work, and then some of the people that are a part of these syndicate-type cults are going to come out there on, I guess, a pilgrimage kind of visit if they have a certain belief that this structure or this location means something more. David: So they can go and take a trip out into the solar system and see this stuff in some cases? Corey: Well, it depends on who it is. David: Yeah. So they could take a tour of what for them would be like a religious pilgrimage site of their gods. Corey: Well, yeah. Some of the people I described that have showed up to some of these meetings, they have off-world access, yes. David: And if Jesus only happens 2,000 years ago, then for them that's just nothing, because this is much older and, for them, probably a lot more interesting. Corey: Yeah, more . . . It's just tens and tens and tens of millions of years ago, some of it, . . .
Corey: . . . which is so far back that they can't accurately date it. David: So you would agree then with Bruce's statement that . . . well, you didn't get the number, but 12 to 16 billion people, and that a lot of them died inside these caverns in the course of the moon coming to the Earth, . . .
Corey: I . . . I don't . . .
David: . . . that there was a massive damage. Corey: There was a massive damage to the structure. David: He also said that it was barely functional anymore at that point, that it made it to the Earth, but that a lot of it was really severely damaged, and it was nowhere near what it was built to do originally. Corey: Yeah. All I know is that it made some sort of tidal lock orbit with the Earth, and now all sorts of ETs have bases there, including us. And there's a lot of mysteries inside the moon that I haven't been made privy to, and I'm told that it was some sort of escape pod-type thing or ark that brought refugees here from a huge cataclysm that made life on their planet impossible. David: Okay. Have you heard that there is any type of AI in the moon or that there's a computer in the moon that could be artificially intelligent? Corey: I know that they use holography, holograms, and other trickery to hide certain things on the moon. Corey: Holograms over certain areas of the surface . . .
Corey: . . . so it can't be seen with telescopes or when they're doing certain things, but I don't know of any type of AI or super type of computer that's being used at the core of the moon. David: Well, this is something that several different other insiders independently confirmed, so I feel like it's pretty solid and likely. So the next thing was he said that some of these people that were inside did manage to migrate to the surface, and at that time, they began building crystal domes out of this transparent aluminum stuff and having trees and civilization on the surface by having that pressurized area. So is that consistent with anything you heard, that there were actual crystal domes on the surface. Corey: Right. There were plenty of ruins of that type of structure. David: Did you personally witness those ruins? David: So what did you personally see as you flew around the moon? Corey: There were domes, square buildings, towers, a lot of the stuff that was buried in, I guess, like, the regolith sand, the lunar sand. Corey: But all that stuff is off limits to people who visit it, and they're of different eras, too, there is damage from different conflicts, and it's off limits to visit. It's held as a reminder of a different time when there was a certain amount of open war before they created these federations and treaties and before they had all of the diplomatic zones on the moon and all these diplomatic agreements that have prevented most of them from being in open war with each other, even though they have competing programs. David: Well, let's real quickly take a look at some footage from the Disclosure Project – it's public domain, open source – of this particular witness who was shown pictures of what he called mushroom-shaped buildings and domes on the moon. He said, “Yes, we've discovered a base on the back side of the moon.” And at that point, I became frightened, and I was a little terrified, thinking to myself that if anybody walks in the room now, I know we're in jeopardy. We're in trouble because he shouldn't be giving me this information. I was fascinated by it, but I also knew that he was overstepping a boundary that he shouldn't be stepping over. And then he pulled out one of these mosaics and showed this base which had geometric shapes. There were towers. There were spherical buildings. There were very tall towers and things that looked somewhat like radar dishes, but they were large structures. So I didn't say any more to him because I was concerned, again, that somebody was going to come in at any moment, would catch us having this conversation, and we would be in real trouble. David: So when we include that testimony, we have independent verification of photographs of these things on the moon, and it's a very fascinating piece of collaborative data. But I just want to ask you a couple questions really quickly. First of all, you said you saw glass-looking domes? David: Were they smashed? Was, like, part of the glass smashed out? Corey: Yeah, they were not intact. David: Okay. How thoroughly damaged did they look? Corey: They looked very ancient and very damaged, very damaged. David: How transparent were they still? Corey: They weren't completely transparent. David: So they were covered with some degree of dirt and sand or something? David: You mentioned square buildings. Were the square buildings also made of this transparent material? Corey: No, some of them looked like they were made of . . . They looked like they were made of some sort of either stone or concrete type of, like, created material. David: What about the towers? Were the towers made of that glass-like stuff? Corey: Yes, like tall, narrow, and then bending back and twisting, like they got hit with a blast wave. David: Well, there's a lot more to discuss with this story, obviously, but I think the key here is that you did see that whatever this civilization was that built domes and developed on the surface of the moon, that they were very heavily attacked, right, because this damage was not something that would happen naturally. This was catastrophic damage. Corey: It was catastrophic, but I did hear that there were a lot of smaller catastrophes that were happening. I mean, if you have a planet explode in your solar system, it's going to knock things around for a while, so there's going to be problems for a while. David: That's a good point. Corey: You know, there were problems going on for a while. David: All right. Well, this has been a truly fascinating discussion. That's all the time we have for in this episode of “Cosmic Disclosure”. My mind has been totally blown yet again, and I hope you're having the same experience there as you watch this. My name is David Wilcock, and, as always, we thank you for watching. I find this topic of a possible, alternate origin for the Earth's moon quite likely. Considering all of the structures which seem to be visible on the surface, one has to wonder how it truly became Earth's first satellite. I am also curious to know what other secrets may be awaiting all of the curious minds here on the surface. With all of this information to consider, one might think the idea of waiting another century for the official disclosure of such information to be ridiculous. They would be absolutely right, in my opinion. The prospect of the partial disclosure presently occurring in the mainstream media is not at all intended to reveal the entirety of the truth to the world, but only the small portion of that truth which has been deemed advantageous to those spinning the story. One of the major distortions of this partial disclosure is that there are no aliens, but that there are only ancient ruins which these aliens left behind millions of years ago. The truth of the matter (according to Corey Goode and numerous insiders whom David Wilcock personally knows) is that not only do we presently have company in this galaxy, but that this galaxy is quite crowded with intelligent life. There seems to be some pretty amazing information waiting for us to learn, and personally, I am not at all interested in waiting another century to hear the entirety of the truth on the matter. If you are looking as forward as I am to when this information is given freely and openly to mankind, join the fight for Full Disclosure now. On this subject, here is an excerpt from one of my past articles entitled. "Conscious Life Expo - David Wilcock - Page 1 - New Intel, The Human Evolutionary Leap, Sacred Geometry, Illuminati Secrets, and More”, on the subject of the true intent behind the partial-disclosure narrative. "This partial disclosure is not at all what we want. These people, who want to end the world and wipe out the majority of the population, want us all to wait a hundred years to disclose. Needless to say, we've waited long enough. Be part of the fight. Go to JoinGaia.com to apply for jobs now." Aside from this opportunity for employment, there are countless positive ways in which we can choose a brighter future for ourselves. It is important for each of us to demand truth from both ourselves and those who hold any amount of authority. In order to change this world for the better, we must come together in positive unity for the sake of our own progress, and the progress of our planet as a whole. 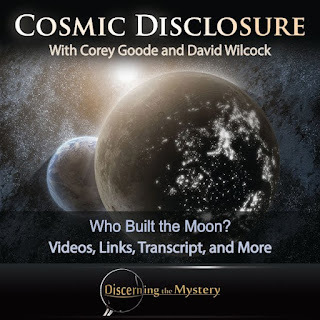 Click here to watch Cosmic Disclosure: Who Built The Moon ?